Anirdesh.com has gone through significant changes since its inception in 2010. I have improved the site's content and layout significantly over this short period. In retrospect, I wish I had saved all the changes during this course. However, I found a few pages to give you a blast from the past. This page serves to archive how the site has changed so I, myself, can reflect on the journey. Check out some of the pages from the past and let me know what you think about how it looked back then and now. September 20, 2015. Ever since the Kirtan Muktavali and Swamini Vato sites were launched, there have been desktop-friendly and mobile-friendly sites. Vachanamrut site was made mobile-friendly after the desktop site was created. 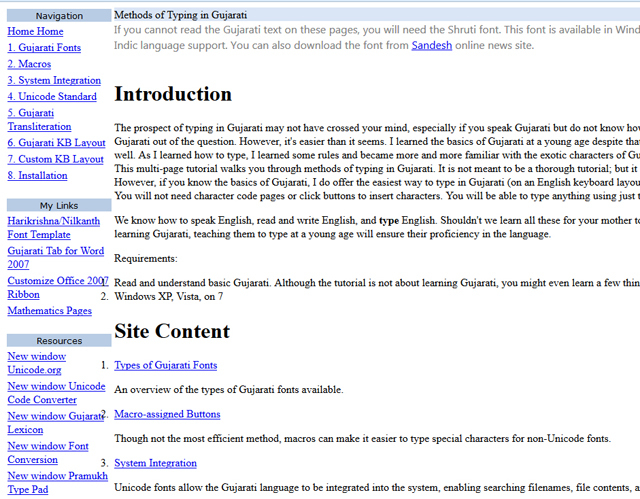 However, the main page and the Gujarati Typing pages were not mobile-friendly. As of today, these sites are now also mobile-friendly, thanks to Google's insistence on ranking sites that are not mobile-friendly lower than those that are. April 1, 2018. Many small improvements have been made to the site through the years. Most of the changes have actually been adding new kirtans to the Kirtan Muktavali Page. In addition, Purushottam Prakash, Sar Siddhi, and Hari Smruti from Nishkulanand Kavya have been added. Bhaktachintamani audio has also been added. Bhaktachintamani page has been completely overhauled to make it more pleasing. Moreover, some minor CSS and HTML errors have been corrected. December 10, 2018. Harililamrut add a few months ago with 8 kalashes done by December 2018. Aksharmrutam added few days ago. Kirtan Muktavali and Swamini Vato landing pages got a face lift. Kirtan Muktavali now has a proper introductory text from the published Kirtan Muktavali. Unnecessary boxes and borders removed for a cleaner look. Swamini Vato got a introductory text also and changed to a cleaner look. Boxes around individual vato also removed for a cleaner text. The inception of Anirdesh began with my tinkering with typing Gujarati. I had learned to type with the Harikrishna font. However, Shruti font was intriguing as it was included with Windows XP but I never understood how to type conjuncts, such as, પ્ત, શ્ચ, etc. Some time in 2009, I stumbled upon BhashaIndia.com's input method editor, which uses transliteration to type Gujarati in Unicode. I don't remember exactly how, but I discovered the Virama key at this time and realized that typing in Unicode was a much superior method as you don't need to know special key combinations to type conjuncts like you do with Harikrishna font. Since the Harikrishna keyboard layout was very easy to learn due to the phonetic key arrangement, I needed to create my own keyboard layout for the Unicode Gujarati keyboard. Finally, I found software that would allow me to do just that. After creating a very easy-to-use keyboard layout for an English keyboard, which I called Guj2Eng keyboard layout (since you are typing Gujarati on an English keyboard with keys placed phonetically), I wanted others to learn and start using it. This is where the website came into play. Anirdesh.com was created to get the word out for this keyboard layout, which is currently called Gujarati Phonetic keyboard layout. All of the other sub-sites came afterward. As mentioned previouly, the site came into existence because of the Gujarati typing tutorial and the Gujarati Phonetic keyboard. Believe it or not, the image on the left shows what the site looked like in March 2010. 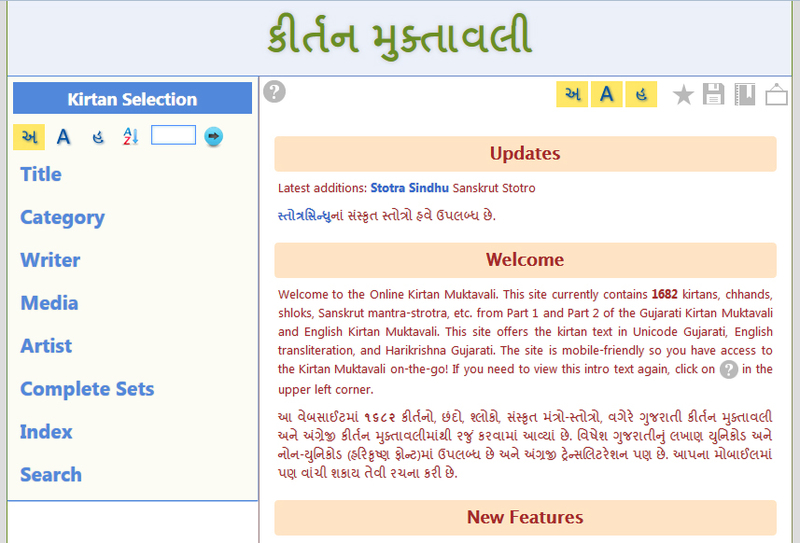 Click on the link - as you can see the site was dedicated mainly to Gujarati typing at this time. It's understandable there's no Javascipt, but there's hardly any CSS either, since that was unknown to me. I also remember a lot of styling I did was the archaic, non-CSS based. For example to align center, I used align="center" instead of the CSS equivalent. 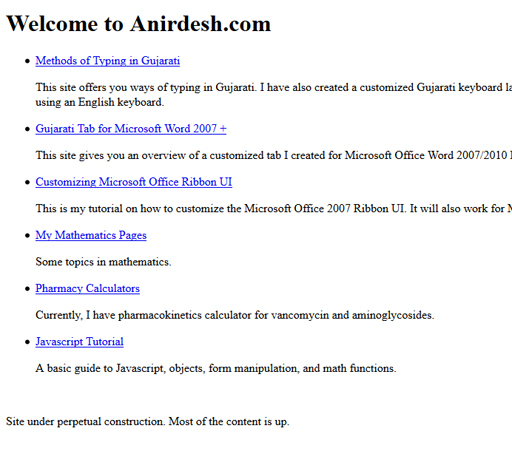 So the beginning of Anirdesh.com was something I created from scratch using simple HTML and sparse CSS. As I added more content, I created subdomains to organize the information, and a bland main page was launched soon afterward. As I began to diversify and add more content, I needed to create the main page that would direct visitor to what they were looking for. Hence, the image on the left shows the simple main page. The note at bottom says "Site under perpetual construction." It would take months before I settled on a good working design. The next image shows the main page from February 2011, albeit I had one other prior design which I've lost. The version was minimal on graphics as I'm not a graphics designer. The image on left shows that by Feb 2011, I had added other content. Prior to the Ribbon site, I had created a "Gujarati Tab" for Word 2007 that would make it easy to type conjuncts with Harikrishna font (so that you don't have to remember the ALT codes). 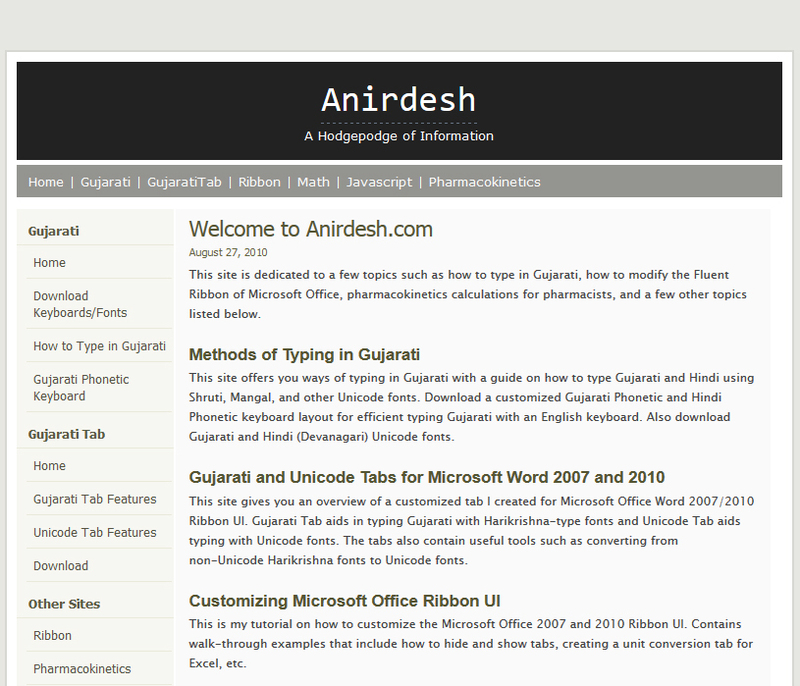 After discovering Unicode Gujarati, I created a tab for that as well and made the template available for download in the GujaratiTab site. Learning how to modify the Ribbon was a task in itself. From what I learned, I made a tutorial, which culminated as the Ribbon site. After the English was completed, I toyed with including the Gujarati text in Unicode format. However, typing the text would be a very time-consuming task. I was able to acquire the Gujarati Unicode text though, which I edited to ensure its correctness with the published version. Footnotes were also included for completeness. Since Gujarati Unicode is not supported by many mobile devices, I then converted the Unicode text to Harikrishna text (with the Unicode-to-Harikrishna converter I created), and made it available online. Finally, for those who want to read the Gujarati version but do not know the Gujarati alphabet, I included the transliteration text. Meanwhile, I made many improvements so that Vachanamrut loads quickly. As of January 2015, I have updated the Vachanamrut site to exclude registration. This will allow everyone to freely read the Vachanamrut. 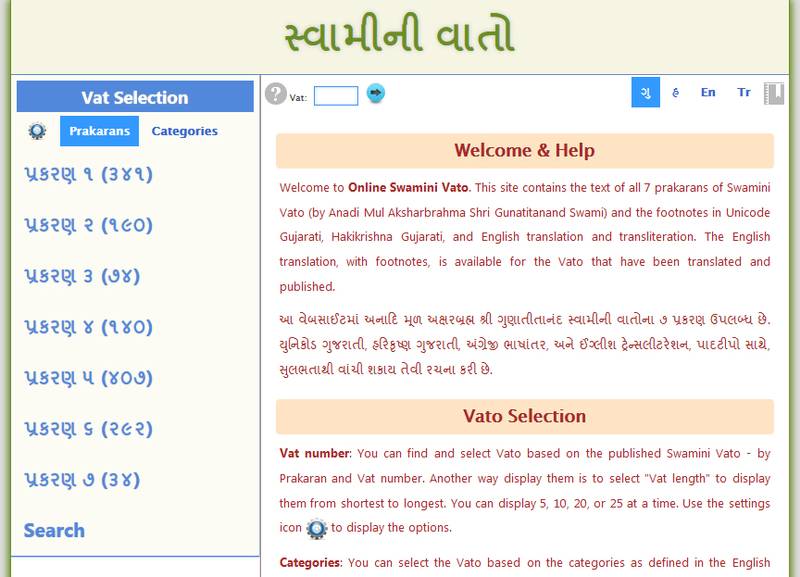 Most importantly, however, the English and Gujarati are no longer separated as two different webpages. It's all one page now and you can easily switch between Gujarati, English, Transliteration, and Harikrishna. It would seem that this was an easy change. However, this was a very time-consuming process because the text markup had to be changed such that the formatting between the two formats would be retained no matter what device you use. Moreover, ensuring the popup footnotes between the different formats worked was a challenge. October 18, 2016. I haven't updated the Vachanamrut site in a long time. However, this week, I have redone the Vachanamrut Audio. The mobile audio widget has a better layout, and both will now require fewer clicks to play the audio. Flash player was removed since all modern browsers support HTML5 audio playback. Also redone is the navigation. Initially, the URL was static and the Vachanamruts loaded via AJAX. Hence, if you viewed 3 Vachanamruts, clicking back button would not take you back to those 3; rather, you would go back to the site that loaded prior to loading this site. Now, however, going backward and forward using your browser buttons is seamless! For this 1 change, a lot of code had to be redone. November 25, 2016. Completed adding Gujarati text with English-text style paragraph breaks for better reading in Gujarati and English side-by-side. February 4 to March 4, 2017. Updated transliteration text to remove spaces before puncturations, change straight quotes to curly quotes, and added English-text style paragraph breaks for easier comparision of transliteration and English in the side-by-side reading. 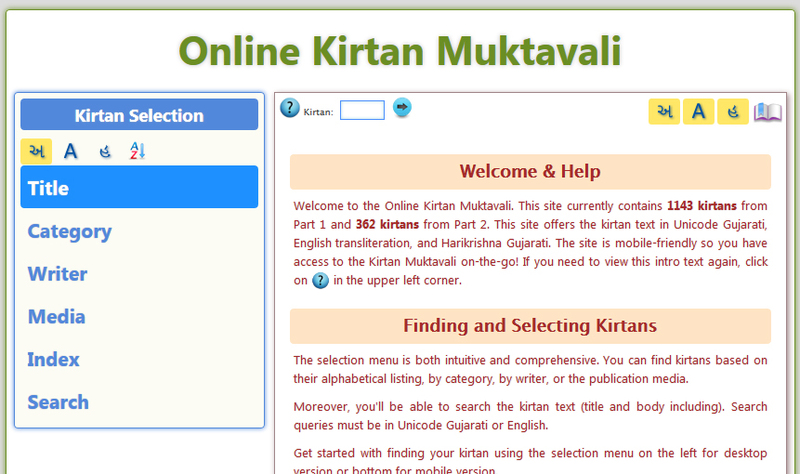 In parellel to typing the kirtans, I was also experimenting on the design of the Kirtan Muktavali page. After the inital design, I didn't make many changes, but somewhere in between I changed it slightly to what it looked like in December 2013. What initally looked good (such as the curved borders and heavy use of shadows) didn't look good after a while so I went for a flatter and boxed look. One other major task was adding the media information for the kirtans that have been sung and recorded. I scoured through my cassettes and CDs to find as much information as I could, including artist and writer. By December, 2013, I had 1682 kirtans. Today, the Kirtan Muktavali site is the most visited site and is the only site to include all of the kirtans from the published books. I'm also proud to mention that a Google, Bing, or Yahoo search for "Kirtan Muktavali" ranks my site as #1. October 18, 2016: Navigating kirtans is now much easier. When viewing multiple kirtans, you will be able to go back and forth those kirtans using your browser's Back and Forward buttons! At some point in 2016 (second half), I added kirtan counts, which allows showing which kirtans are being hit most. The data is wiped on a weekly basis in case someone tries to intentionally drive up the count. Another addition is the kirtan audios. 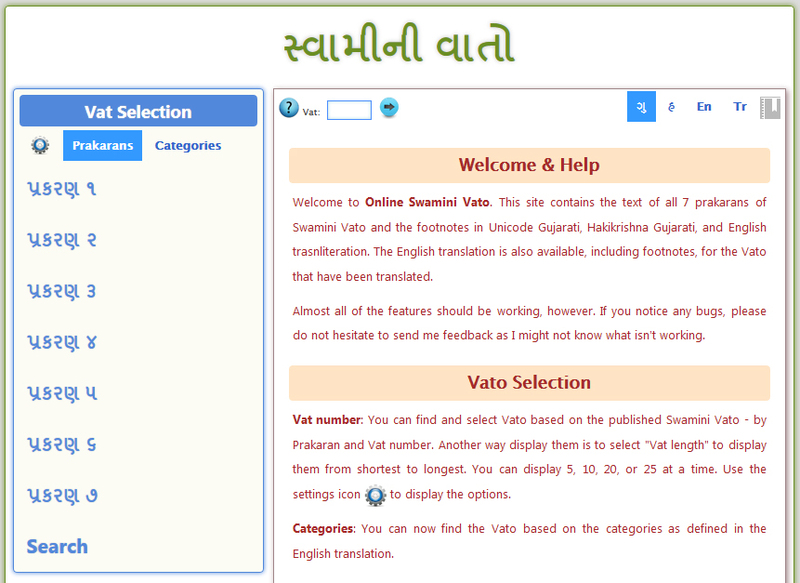 It was necessary to make the Swamini Vato text available online, as the Vachanamrut and Swamini Vato are the most important scriptures of the Swaminarayan Sampraday. Since I read these daily, it was worthwhile to make the pages mobile-friendly. The Swamini Vato page design was just a clone of the Kirtan Muktavali design with a different color scheme. I spent more time on the text than the design so it would be available to visitors as soon as possible. Initially, the site included Gujarati Unicode, Harikrishna, and broken transliteration without any capitalizations. I corrected the transliteration text after Gujarati text was done. Then I included the English translation, which was a painstaking task as the English version does not follow the same Prakaran/Number scheme as the Gujarati Swamini Vato. Next facelist of the Vato site was similar to the second iteration of the Kirtan site. Graphics were minimal so pages loaded faster. However, since mobile tech became faster and phones have become faster, currently I have decided to include header graphics to make the site look polished. One challenge in programming these websites is making the Gujarati text readable for all of the different operating systems and mobile devices. For example, Windows XP/Vista/7, Mac OS X, and Linux all support Unicode Gujarati. The iPhone supports Unicode Gujarati as well but as of August 2014, Android and Windows Phone do not. Hence, using a service similar to Google's Font API, including Gujarati Unicode text was possible, while Harikrishna text provides a fallback method for those devices that do not render Unicode correctly. Today, all of the Gujarati text should be readable on any mobile device using one of the methods I have used. Beginning December 25, 2015, I'm starting to proofread the Swamini Vato with the published version and also revising the puncturation to match the English language style punctuation. Errors corrected: a few errors in terms of missing words or extra words have been corrected. Quotations have been changed to curly double quotes (“ and ”) and quotations within quotations have been changed to single quotes (‘ and ’). Many quotations were left open or closed without an opening quotation. These all have been corrected. If a dialog is clearly discernible, then quotations have been added. If Swami is talking without a dialog, quotations have been omitted as in original version. Spaces before question marks, exclamation marks, and colons have been removed so as to avoid these punctuations appearing at the beginning of a line by themselves. Colons before quotations have been changed to commas as it more commonly found in English language style punctuations. All these changes have been made to standardize the text based on the English language style convention. None of the words have been altered in any way that would change the meaning or the text. Initially, the transliteration of the Bhaktachintamani was done by my conversion tool. On November 10, 2014, I begin fixing the transliteration text. As of June 25, 2016 (after almost 20 months), it is finally complete! March 31, 2018: For almost 4 years of the Bhaktachintamani being added to Anirdesh.com, the page design has been bland. Finally, as of today, the page design has been updated to match the Kirtan Muktavali and Nishkulanand Kavya pages. Also, the browsing backward and forward feature (retaining the URL) has also been added. September 17, 2017. Purushottam Prakash is now available in Gujarati. Audio also included. March 31, 2018: Name changed to Nishkulanand Kavya as Sar Siddhi was added. Then Hari Smruti with audio also added. Plan to add Bhakti Nidhi soon.